ARCHIVED HD BROADCAST – Have you ever wondered how diagnostic trouble codes are set and how the engine management system makes those decisions? You might think the answer to this question is complex, as we are talking about European vehicles and most technicians believe EURO vehicles can only be diagnosed using an expensive OE or enhanced aftermarket scan tool. In reality the answer is simple and the solution is closer and less expensive than you might think. 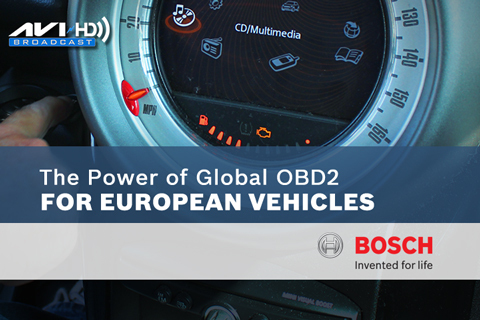 The solution is fully understanding the power of Global OBD2 and this HD streaming event, sponsored by Bosch and presented by Jim Wilson, will provide the information needed to successfully use a Global OBD2 scan tool on European vehicles. Review the powerful list of Mode $01 data parameters. Understanding the power of Mode $02 – Freeze Frame data. Know how to use Short Term and Long Term Fuel Trim as a diagnostic baseline and repair verification tool.